Response to Intervention (RTI) is one of the cornerstones for building an exemplary program for any campus. RTI was developed to address the needs of the student who is educationally at risk for academics, behavior, or socialization. This folder is designed to make the RTI process easier to implement. As a comprehensive documentation tool, the folder is user-friendly and can effectively keep referrals to special education or 504 to a minimum while ensuring student success. 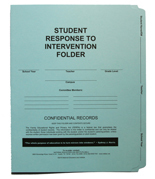 Order a sample of our RTI Folder! Send us an email! We will get a sample out to you right away.